I love a craft project that doesn't require me to go out and buy anything, especially one using items I'd otherwise throw away or recycle. That's why I'm really excited about my latest project. I was hit with an idea last week when I realized I could make something with the old paperback I was planning on donating and a string of lights destined for the trashcan. I could use both to make mini lanterns! Paperback Lanterns are super easy to make, super adorable and super geeky, especially if you use pages from one of your favorite series like I did with Ilona Andrews' Magic Burns. Interested in making your own? Good 'cause here's how you do it. Got all that? Now it's time to begin! 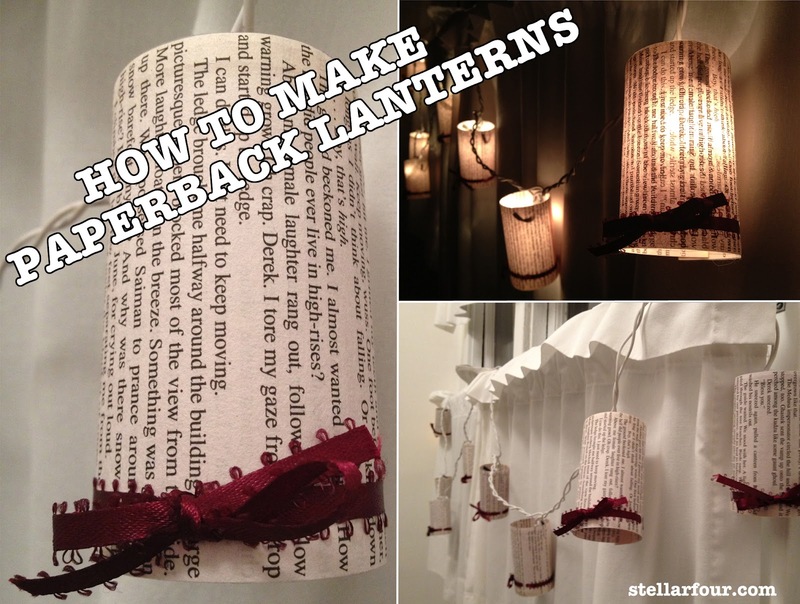 Step one: Carefully separate one page for every lantern you plan to make from the book and trim the sides so all are uniform. I found it was easy to remove the sheets by slowly pulling them out, being careful not to crease the paper. Two tips for choosing pages: Look for ones without a lot of white space; the lanterns won't look as uniform nor as attractive without a lot of text. 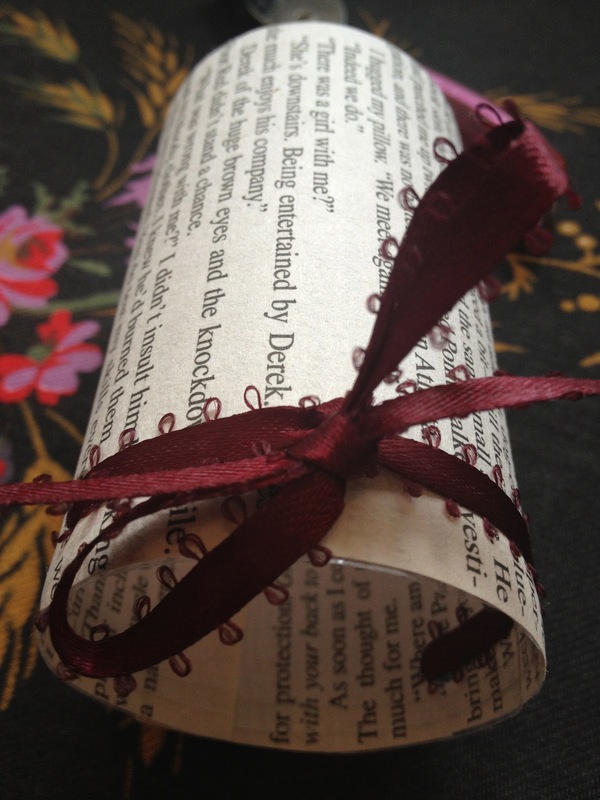 Also, look for passages with interesting descriptions or dialog. It's more fun that way. Step two: Cut two strips from the straight area of the bottle for each lantern you're making. 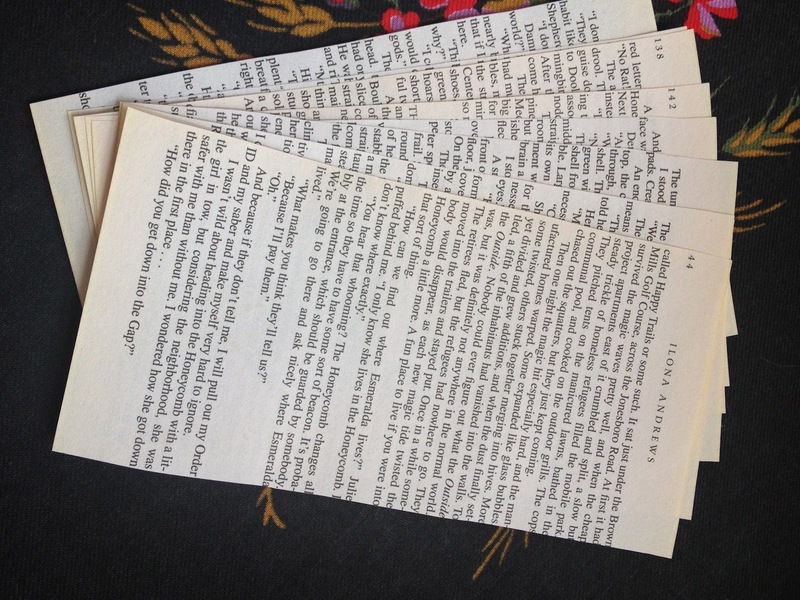 Each strip should be approximately 1/8 of an inch thick and slightly longer than the page. The strips will provide frameworks for the lanterns. (It might not seem like they provide much support, but the strips will help pop the lanterns back into shape should, let's say, a certain Persian cat decide to sit right on top of one while you're assembling the project.) You may need additional bottles depending on how many lanterns you plan to make. Step three: Place the plastic strips onto pieces of packing tape slightly longer than the pages. Position the strip about 1/8 of an inch below the edge of the tape. This will help keep the strips attached to the lantern. Make two for each lantern. Step four: Attach the packing tape with strips onto the inner side of the lantern. Align the tape on the page so that the sandwiched plastic strips are at the top and bottom of the paper. 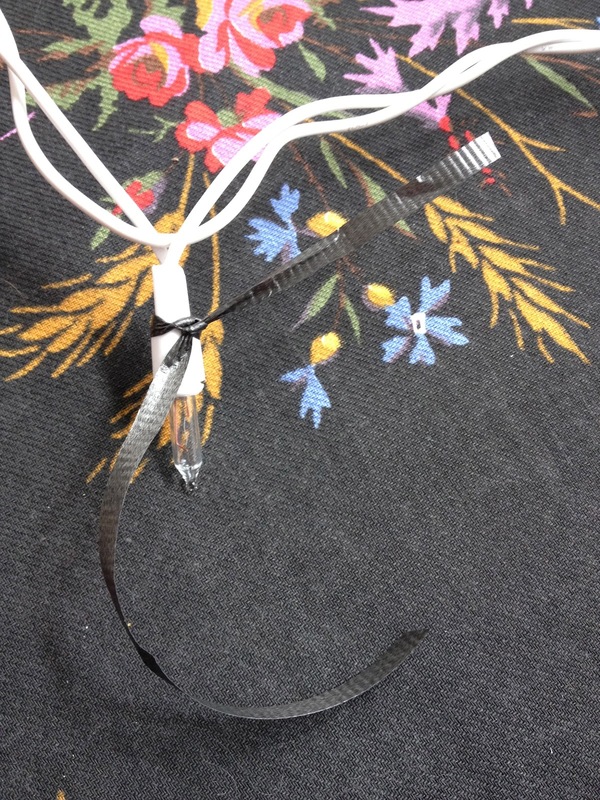 Step five: Trim off any excess tape and plastic strips at the ends. 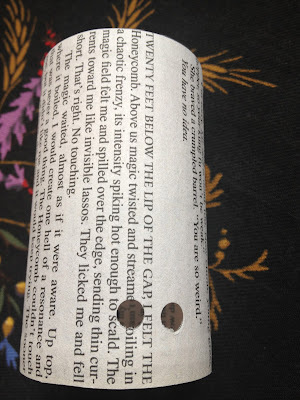 Step six: Roll the page into a cylinder and secure with double sided tape. 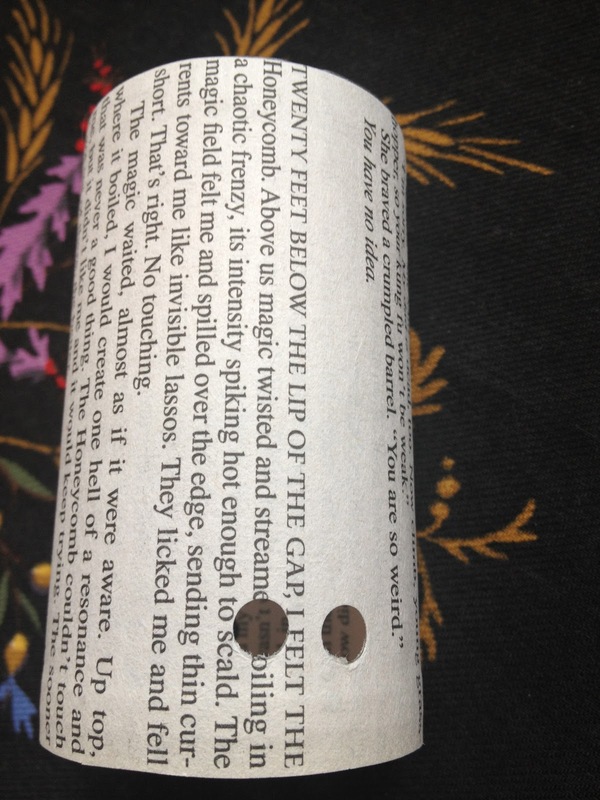 Place a strip of double sided tape on the outer side of the lantern at what used to be the bottom of the page. Then, place the other end on top of the strip of tape creating a cylinder. Step seven: Punch four holes into the base of the lantern. Punch two holes approximately 1/8 of an inch apart and 1/2 an inch from the base. Repeat this step on the opposite side of the base. You'll be using the holes to attach the ribbon to the lantern. Step eight: Attach the ribbon to the lantern. Slip a foot long piece of ribbon through one hole, back out the adjoining one, then continue to thread the piece through the holes on the opposite side of the cylinder. Tie the ends of the ribbon into a bow and trim any excess. Step nine: Using a piece of ribbon and more tape, attach the lantern to the light string. First, knot the ribbon around the base of the light and then tape the edges of the ribbon to the inner sides of the lantern. Trim off any excess. Repeat these steps until all have been attached. 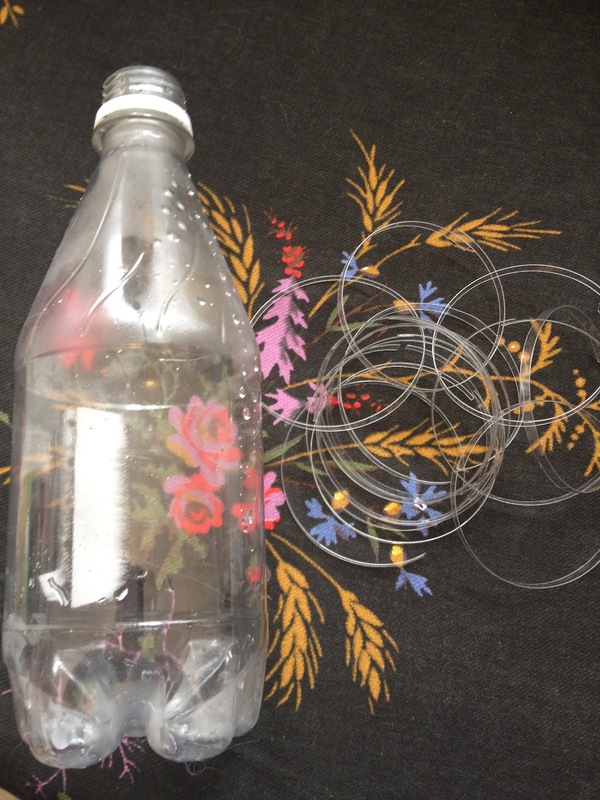 Note: If you have it, use plastic fishing line or some other type of clear, flexible ribbon or thread. Ribbon casts a shadow when the lanterns are lit. Clear material won't. Cute! I have some books the kids have loved to the point pages are gone, so I couldn't donate them at all. This would be a fun way to re-purpose the pages. Thanks!